How did Lieutenant General Joseph Carroll, in his person and his history, embody the forces that shaped James’s life and behavior? How are various hierarchical authorities, both institutional and individual, portrayed in the book? How do father and son, individually, relate to them? What is the significance of Carroll’s beginning the book with his ordination Mass and closing with Joseph Carroll’s requiem Mass? Is this framing device appropriate to the progression of the book’s narrative? In chapter 1, Carroll writes that, during the early years of his anti-war activity, “I was two people, and . . . each of my selves seemed to have a coherence and integrity that were belied by the fact that I could not bring them together.” Does he succeed in integrating his disparate selves? In chapter 1 and again in the final chapter, Carroll writes, “I believe that to be made in God’s image is to do this: arrange memory and transform experience according to the structure of narrative. The story is what saves us.” How does this belief relate to both Carroll’s personal development and his book? The concept of redemption recurs in various contexts, not all of them religious. What kinds of redemption are presented? Does one eventually assume precedence? What are the similarities and differences between Carroll’s life and his father’s? How did his father’s life and career shape Carroll’s own? What photographs in the book seem of particular importance? What is their significance in the progression of James Carroll’s life? Several men play important roles and have profound influences, both positive and negative, at key points in Carroll’s life. Who are these men and what are their roles and influences? 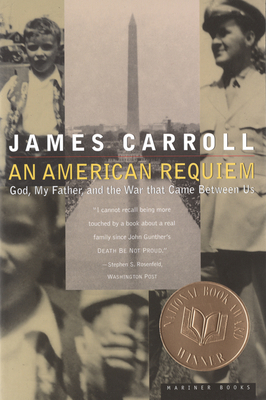 In chapter 3, Carroll writes that “[presidential] inaugurations had been like a sacrament of the streets to me, rituals of rebirth,” and he later refers to “the holy mysteries of Washington.” What other religious or liturgical terminology is used to characterize political and social events, places, and people? What effect does the use of this terminology have? What biblical allusions and images occur in the book? How do they enhance Carroll’s narrative and our understanding of his story? Does Carroll succeed, at the book’s conclusion, in achieving “the acceptance and forgiveness and affirmation” that, in chapter 4, he longs to bestow on his own younger self? In chapter 5, Carroll identifies “three distinct but related revolutions&emdash;interpersonal, religious, political&emdash;that I underwent as a Paulist.” Does he convincingly demonstrate the occasions and nature of each of these “revolutions” as the book proceeds? In chapter 6, Carroll refers to “the worship of false gods, the making of idols” as “the sin to watch out for.” What does he mean by this? Can you identify the false gods and idols to which he refers? What bearing on his personal story do Carroll’s narratives of events outside his own direct experience or observation have (e.g., political corruption in 1930s Chicago, the FBI’s harassment of Martin Luther King)? Are they necessary to his, and our, understanding of his experience? The words “priest,” “poet,” and “prophet” can be applied, individually or together, to specific persons who appear in Carroll’s narrative. Who are these priests, poets, and prophets, and how do they embody the qualities of each role? Does Carroll present a coherent picture of the true dynamics of his family, including his own relationships with his mother and four brothers? Does he focus too narrowly on his relationship with his father? On the book’s final page, Carroll makes a number of statements that reflect on both his life and his book. How does each of these statements relate to everything that has come before?